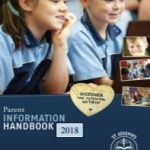 The family’s commitment to Christian principles and faith expressed in their Parish community and their willingness to fully accept the school’s Religious Education program. A positive commitment by families to contribute to the well-being and community nature of the school. Children must turn 5 years of age on or before 31 July of the year of commencement. Children turning 5 years between 1 April and 31 July may be enrolled at the discretion of the Principal and on the agreement of parents that the child may be asked to repeat a class if this is considered advisable. Children enrolling in Kindergarten are required to provide the school with a NSW Health Department Immunisation Certificate for Primary School Enrolment which can be obtained from your Doctor. Immunisation itself is not compulsory however, in the event of an outbreak of a vaccine-preventable disease in a school, unimmunised children will be required to remain at home for the duration of the outbreak for their own protection. The vaccine-preventable diseases are Diphtheria, Tetanus, Whooping Cough, Polio, Measles, Mumps, Rubella and Meningococcal. The full Enrolment Policy is available from the school office.